Who was Lilias Trotter? My acquaintance with this remarkable woman began with a fortuitous meeting with two elderly sisters who were wintering in my hometown. They wanted to divest their library while downsizing their lives, and their main concern was that their prized collections of books by and about Lilias Trotter would be lost in the transfer. The value they placed on this collection whetted my interest, and I listened attentively as they told her story over an extended luncheon. Lilias Trotter was born in 1853 into a wealthy English family. She grew up in the privileged surroundings of London's fashionable West End, experiencing the private tutelage of governesses at home and the stimulation of continental travel abroad. Her spiritual responsiveness was quickened in her early twenties during the deeper life conferences, which developed into the permanent Keswick Convention. Her freshly kindled faith was stretched and applied in mission work to prostitutes and in full-time volunteer work with the then fledgling YWCA. Parallel to her zeal for service was a passion for art born of an innate sensitivity to beauty, matched by an exceptional God-given artistic talent. This talent, and the place it would have in her life, would be profoundly put to the test by her meeting in Venice in 1876 with John Ruskin, the foremost art critic of the day. His ambitions for her were great—he believed that under his tutelage she could become one of England's greatest living artists. I see as clear as daylight now, I cannot give myself to painting in the way [Ruskin] means and continue to seek first the kingdom of God and His righteousness. With this painful issue of the heart resolved at last, she continued her friendship with Ruskin and continued to paint, but her first priority was to her ministry in London, where she fully intended to love the needy for the rest of her life. Then, almost a decade later at the age of thirty-four, she heard a message about those in Algeria who had never heard the name of Christ, and she felt God's call to go. The rest happened in an astonishingly short period of time. She applied to North African Missions and was turned down for health reasons. She then, with her own resources, set out to Algeria to work alongside—but not connected with—the same mission. Almost a year later, she traveled with two friends to Algiers, where she didn't know anyone or even one word of the native Arabic language. She spent the remaining forty years of her life in a French colony (which resented England) bringing the light, life, and love of Jesus to the Arab Muslim people (who resented Christians), learning the language and loving the people. If we may but be a crystallizing point from which God can work, it matters nothing how insignificant that starting point. Take the very hardest thing in your life—the place of difficulty, outward or inward, and expect God to triumph gloriously in that very spot. Just there He can bring your soul into bloom! Faith is the link which joins our uttermost weakness to God's almighty strength. I am full of hope that when God delays in fulfilling our little thoughts, it is to have Himself room to work out His great ones. What about her legacy? During Lilias's forty years of ministry, she pioneered means, methods, and materials to reach the Arab Muslim, considered today to be a century ahead of her time. She wrote a body of English devotional literature as well as developed a culturally sensitive literature for the Arab world. There is no way, of course, to measure the love and light she brought to countless individuals with whom she lived and served. Some people believe that the growth of the Christian church in Algeria today is the germination of seeds planted a century ago by Lilias and people like her. Lilias, herself, offers the perspective that provides the ultimate answer, quoting from Revelation: "Their works do follow them." She goes on to write, "And the results need not end with our earthly days. . . . God may use, by reason of the wonderful solidarity of His Church, the things that He has wrought in us, for the blessing of souls unknown to us: God only knows the endless possibilities that lie folded in each one of us!" My belief is that Lilias's works do follow her in this world—and the next! And her lesson to us, I believe, is that anything we do for God has a life that goes beyond who or where we are and, in His way and His time, will be used for eternity. 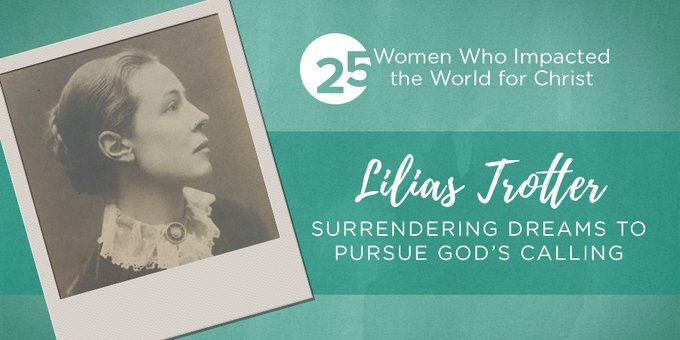 Would you like to learn more about Lilias Trotter? We recommend her biography, A Passion for the Impossible by Miriam Rockness. We're also giving away two copies of A Blossom in the Desert—a compilation of Lilias's watercolors with her devotional writings and a short biography at the front of the book. Just log on to the giveaway widget below for your chance to win. Miriam lives in Lake Wales, Florida where her husband Dave pastored the First Presbyterian Church for thirty-seven years. Her love for the Word and devotion to family informed her role in ministry: teaching Community Bible Studies and Family Living Seminars as well as writing a trilogy on home and family: Keep These Things, Ponder Them in Your Heart, A Time to Play, and Home, God's Design. Her admiration for the almost forgotten Lilias Trotter fueled her research for A Passion for the Impossible: The Life of Lilias Trotter and the companion book, A Blossom in the Desert: Reflections of Faith in the Art and Writings of Lilias Trotter.